Bombardier beetle spray-bottle explained at last! Photograph of a bombardier beetle (Brachinus elongatulus) in action. The many species of Bombardier beetles inhabit moist ground layers of temperate forests and grasslands around the globe, with B. elongatulus calling Eastern Europe home. They feed on small insects nocturnally while keeping predators like tree frogs at bay with their explosive hind parts. 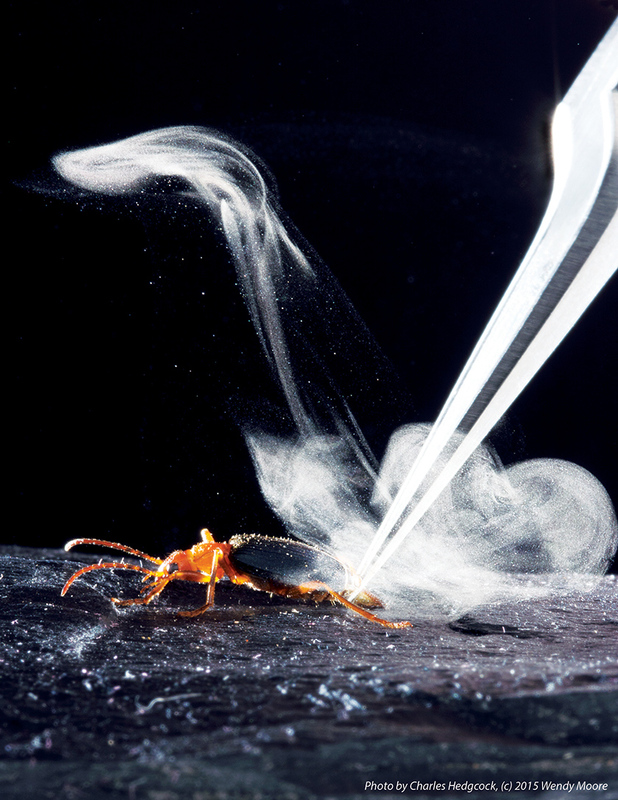 In a development that's sure to catch fire in the growing market for organic self-defense sprays, a group at MIT has figured out how the bombardier beetle produces its hot, irritating defensive spray. Squirting across a few centimeters at close to water's boiling point, the spray long ago caught the eye of curious biologists. Members of the "Brachinini" tribe -- a sub-group of the 1,400 species of bombardier beetle -- defend themselves by spraying a toxic brew ready-made for the occasion. In this week's Science, we read the structural details behind this bio-chemical warfare. "We have beetles with an explosion inside the body, and they don’t die," says first author Eric Arndt, a Ph.D. student in material science and engineering at MIT. "How? People have studied this for a long time, with most of the focus on the chemistry of explosion and the behavior of the beetles. There was very little mechanistic work on what happens inside the beetle." The spray is produced by a complicated gland at the hind end, Arndt says. "I got this idea: How about we use this half-billion dollar machine and take high-speed video to see the explosion?" Arndt is referring to the Advanced Photon Source at Argonne National Laboratory, which, he says, "pioneered live-imaging of centimeter-sized animals; it's been used to see how insects breathe, how butterflies drink, and now how beetles defend themselves." The work by Arndt and his advisor, Christine Ortiz, shows a rapidly pulsing spray created by a series of explosions created when a chemical called the reactant is exposed to a catalyst inside a reaction chamber. That chamber turns out to be highly engineered by evolution to make, heat and shoot the spray while protecting the beetle from its own chemical weapon. The abdominal squirt-gun of the bombardier beetle has striking similarities to a pulsejet, a propulsion system that fires in pulses. Roll over graphic to see the pulse jet that powered the first cruise missile, the German V-1 "buzz bomb" that attacked London in 1944. The basic trick of the Brachinus elongatulus beetle under study was already known. It works like a pulse jet, with the energy released in a staccato of small explosions, each containing about 6 micrograms of toxic fluid. Pulsing produces a cascade of benefits, Arndt explains. "High spray velocity reduces latency, so you get your message to the predator quicker. Because pressure is proportional to the amount of spray, the pressure is lower, so they don’t need the reaction chamber to be so strong, and they don’t have to spend as much energy building the structure." As a fringe benefit, the beetle has better aim because the lighter shot reduces recoil. The most surprising finding, Arndt says, is a flexible reaction chamber. "You would expect for an explosion chamber that you don’t want it to deform, particularly inside an exoskeleton that does not have a lot room to give." The deformation of the reaction chamber, however, helps regulate the pulses, by closing the valve that allowed reactant to enter the chamber, which protects the beetle from the hot, toxic spray it creates. Then, after the spray jets out, the pressure drops and the valve opens, so more reactant enters the chamber. Why would a material scientist be interested in a beetle's toxic spray if he doesn’t prey on bombardier beetles? Because the entire assembly of reactant reservoir, valve, reaction chamber and nozzle is a one-piece structure made of a natural material called cuticle -- the same stuff that builds an insect's external skeleton. "Insect cuticle is amazing, and these beetles use it quite cleverly," Arndt says. Think of plywood -- where the wood fibers are stacked crisscross style to balance their physical properties and make a material that's more or less equally strong in all directions. Synchrotron X-ray video of pulsed explosions inside bombardier beetle defensive glands while the beetle ejects its defensive spray, recorded at 2,000 frames per second, played back at 25 frames per second. 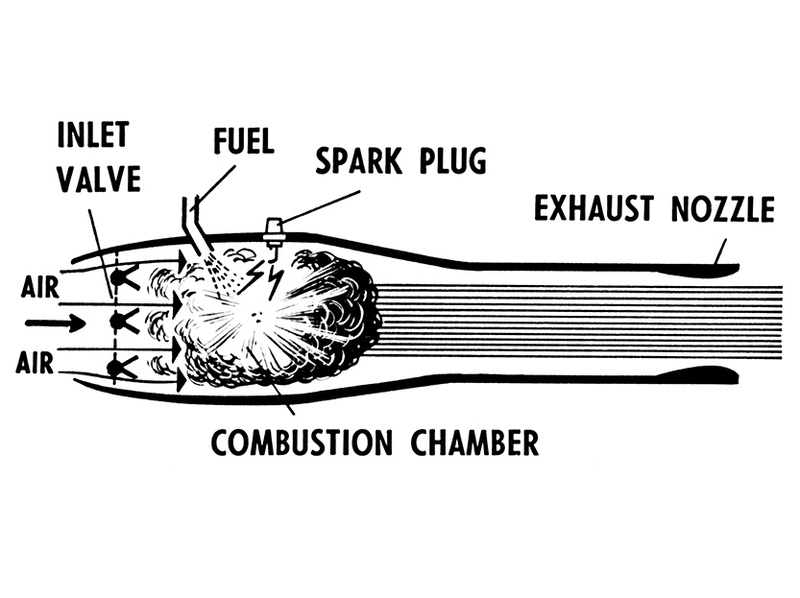 Pulsating bright regions are vapor pockets inside the glands; each pulse (enlargement and blurring of vapor pocket) corresponds to an explosion. "The work explains how internal explosions, high-repetition rate pulsed-jets and liquids hotter than boiling water can all be generated and tolerated by living tissues," says Pupa Gilbert, professor of physics and chemistry at the University of Wisconsin-Madison. "These are amazing feats of bioengineering, which evolved to defend the beetle from its enemies," says Gilbert, who studies nacre (mother of pearl). "I just hope I will never cross one of these beetles!" Chitin, the fibrous material in an insect's exoskeleton, is even better. The nanometers-in-diameter chitin fibers "are stacked in layers, and each layer is rotated slightly, so no matter which direction you stretch, it has same mechanical properties," Arndt says. The spray gland is an outgrowth of the exoskeleton, Arndt says. 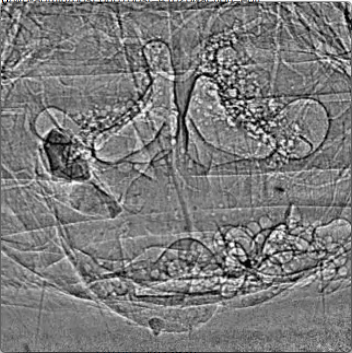 "It goes from the stiff exoskeleton to an exit channel that is half flexible and half very stiff, to a reaction chamber that is mostly stiff, but has specific areas that are thin and flexible, to a reservoir that is flexible, and to a valve that is made of a rubbery material. It's one thing, but the material properties vary all the way along." By varying the direction of the chitin fibers, and altering protein and water content, insects "achieve a level of intimate control of material we’d love to achieve," Arndt says. "The cuticle exoskeleton is a key to the success of insects," says Arndt, "which arguably are the most successful organisms on the planet because they have this exoskeleton that provides protection but allows them to get around and regulate water content." Cuticle also houses and protects spiders and mollusks -- the crabs, lobsters and bivalves, and is found in their various fangs, pincers and shells. Biomaterials in general are eminently effective, Arndt says. "A lot of work is going on to understand how animals make these materials: nacre [mother of pearl], insect cuticle, wood, bone. These are very high performance materials, because animals have intimate control over the nanostructure as they are created. As scientists we can't do that." On the wing: Birds, skeeters, jet planes: Same design rule applies!